Thanks for giving me an opportunity to tell you a bit about myself as the creator and founder of Hiking For Her. I'll also explain how I am able to share the best hiking tips and lots of trustworthy how to hike advice for female hikers on this website. Best Hiking Tips For Dayhikers: Everything You Need To Know To Hit The Trail. If you're looking for the fastest way to get in touch with me, use this CONTACT link. First off, my hiking credentials. I grew up in a very small rural town in Michigan's Upper Peninsula. For those in the know, I'm a Yooper, and proud of it. Surrounded by forests and lakes, and as an only child for 10 years, I spent most of my time playing in the dirt while developing a keen eye for plants, animals, weather patterns, and anything else related to being outside of four walls. Back then, I was called a "tomboy". I still am! And proud of that as well! My initial hiking experience as a Yooper tomboy developed over several consecutive summers of attending a youth camp. The hiking counselors showed us how to hike through any weather. During these daily hikes, my eyes were opened to how plants and animals lived in certain areas, dependent upon access to food, water and sunlight, and were vulnerable to human traffic patterns. During the long cold winters between summer camp, I devoured books on rocks & minerals, animals, insects, and botany, trying to find answers to all of my questions. I couldn't wait for spring sunshine, to go exploring in the woods behind my house. By the time July rolled around, I was more than ready to go back to camp for more hikes. From these quick little nature strolls, I graduated to week long backpacking expeditions with organized groups, including the Girl Scouts of America. I'm on the left, with my intrepid trail buddies Kerry and Mary, exploring the Porcupine Mountains in the early 1970s. Dig the external frame backpacks! These organized trips prepared me to go off with just a trail buddy or two, for extended trips to tackle more adventurous terrain. And make a lot of mistakes. Looking back at how naive and unprepared I was for the challenges and unexpected hurdles on the trail, I'm thankful to be here! After I moved from the Midwest to the Pacific Northwest 20+ years ago, my hiking knowledge expanded by huge leaps and bounds. I became a strong day hiker, meeting and conquering the challenges of weather, terrain, insects, navigation, safety, and animal encounters. I met people who challenged me to go into the back country and melt into Mother Nature, leaving no trace. I've also hiked in the Canadian Rockies, the Northwest Territories and the Yukon, as well as East Greenland. I pick up different skill sets according to the terrain and climate I find myself in. I'm eager to expand my knowledge base in my hiking travels over the coming years, and will report back faithfully on this website. You can come along on my hikes with me (in a virtual sort of way)! I don't consider myself an elite hiker, just a motivated older woman who wants to maximize her trail time and satisfy her curiosity. My bookshelves are groaning beneath the load of my field guides, identification manuals, and trail reports. Being an acknowledged book addict, I don't allow myself to wander into the Nature/Science section of book stores too often! And my e-reader? Stuffed full of hiking stories, guides and testimonials to the fantastic sport of hiking. My other credentials for creating this website are also related to my insatiable thirst for answers. Many years were spent in clinical labs, research labs, classrooms, first as a student, then as a researcher, care provider, and professor. But all those years indoors, trapped in my head, never blunted my thirst for the wild places... and now I use my science and health background and research skills to dip into medical literature and pull out helpful facts about living optimally in a female hiker's body. All of the tips and trail advice I share is based upon that solid science foundation, tempered with real life experience. And I post it here for you to enjoy. Another important "credential", if you could call it that, is my gender. Women approach hiking differently than men, both psychologically and physically. Being outdoors means many different things to women, somewhat dependent on where they find themselves in the natural progression of the life cycle, but also on what their hiking attitudes are based upon. As a female hiker, I've hiked solo, with single trail buddies of either gender, and in groups. foxes, black and brown (grizzly) bears, moose, all sorts of deer, bison, elk, musk ox, wolves, coyotes, snakes, insects, arthropods, an assortment of birds, mountain goats, Dall sheep, caribou, weasels, marmots, bobcats, cougars, and ground squirrels ... in no particular order. 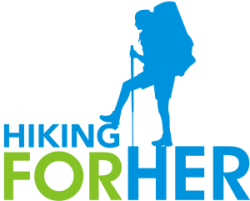 Curious about what others are saying about Hiking For Her? 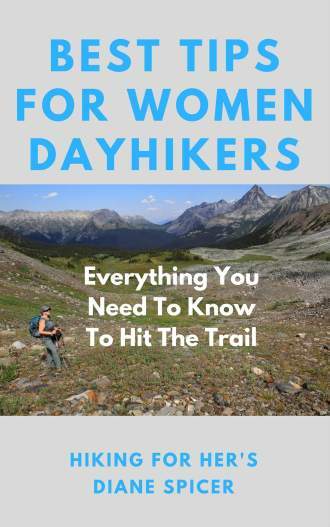 Through all of those hours planning hikes, gathering observations on the trail, processing what I've learned into web pages and a book, and talking about hiking in interviews, podcasts, and more, I've become a good resource for hiking information for hiking women. 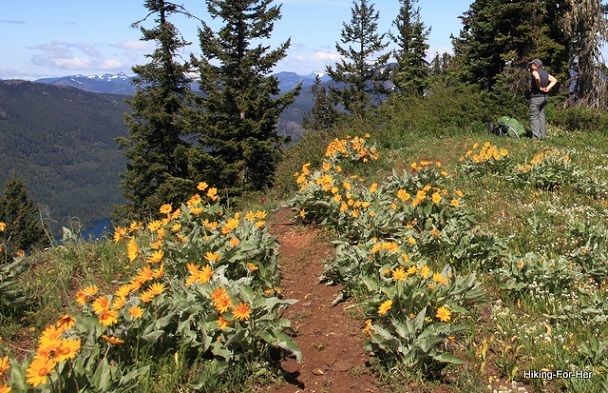 This website has been called a hiking encyclopedia, which thrills my scientific mindset. And motivates me to keep learning and developing as a hiker, so I can keep sharing it all with you. If you find only one small thing useful or entertaining on this website, I will feel deeply satisfied. If this information motivates you to pull on a pair of hiking boots and charge off into the unknown, or gives you tools to strengthen your hiking skills, then you've made me one happy hiker. Read four great reasons for becoming a hiker. Wondering about how I support this website? We can meet at a Seattle area gear store of your choice, and go gear shopping together! I can point out what will work and what to avoid for your particular hiking plans. We can work together via phone calls and emails to craft your itinerary, gear list, and trail skill achievements. More details here. Just need a gear chat? We can do that, too! Wondering how we could work together to spread the word about hiking far and wide? If you're interested in a customized hiking slide show or workshop designed just for your group or class, I'd love to do one for you! Want me to teach a class on any of the hiking skills you've read about on this site? Not only am I interested, I'm honored! Need an honest and fair (unpaid) gear review for your outdoor product? See examples here. 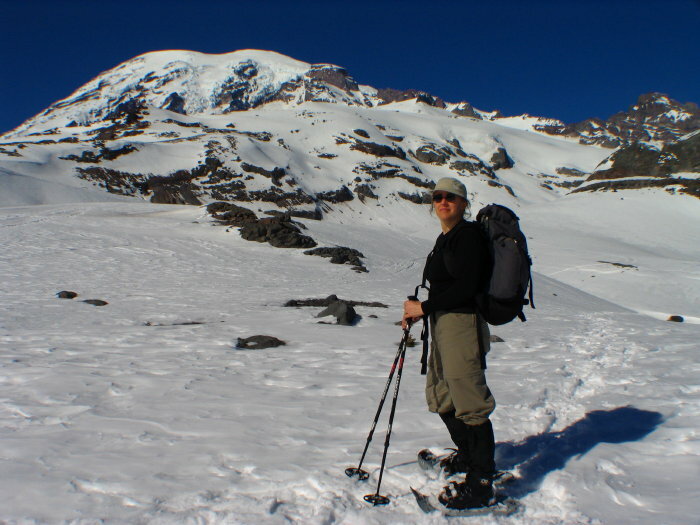 Need an experienced hiker as a guest on your podcast or radio show? Want to give away hiking gear or sponsor a contest? Examples here. Have other interesting ideas for a collaboration? Let's talk about it! I appreciate your visit to my website, and sincerely hope you found some great hiking tips to make your trail time more enjoyable. a portion of its lost heart." Hiking For Her would be delighted to give your product(s) a fair test in the great outdoors. Nothing brings more joy to a hiker than a new piece of quality gear! My reviews are detailed, balanced and based upon decades of experience with outdoor gear. You can get in touch about setting up a product review here. We can talk about a featured giveaway, too. If you are interested in a glimpse into the hiking world through the eyes of Hiking For Her, let's set up an interview, podcast episode, radio segment, guest blog post, speaking engagement, consulting session, or whatever else you have in mind. Past media collaborations can be found here. This will put you in touch so we can start chatting!